when Leonardo was 16 his father had gotten married again to a 20 year old Francesca. He made for a man named Francesco Del Giocondo. 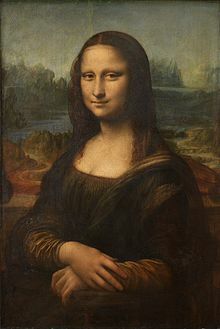 The Mona Lisa is supposed to be Francesco's wife but some believe that its Leonardo as a women because his face fits Perfectly into the painting. Leonardo painted the Mona Lisa at the Sistine Chapel in Rome Italy. On August 21 1911 the Mona Lisa was stolen, it was not noticed until the next day mid afternoon, Around 60 investigators were looking for the famous painting. After two years then being 1913 of hearing no word about the real Mona Lisa investigators had done it they had matched the finger print that was on the Mona Lisa's casing which was left of the stair case in 1911. Alfredo Geri was found guilty, after many arrests for Innocent people they had found the man who had stolen the great painting,it has now been 100 years with the Mona Lisa been untouched now still in its casing in the Louvre where it belongs because it truly is a piece of amazing history. Leonardo had one of the most creative minds in the world which he used for inventing things. Leonardo did not attend any university for formal education.invented the parachute, the hand-glider,diving gear,an army tank,an early bicycle,musical instruments, hydraulic pumps, finned mortar shells, steam cannon,flying machines,scissors,helicopter,and an light hang glider. But most of his inventions were left unfinished. A few hundred years after Leonardo died the helicopter was built. submarine,a flying machine and many war tools. Leonardo loved to invent and if it wasnt for him we wouldnt be able to have all these things today.